It took him eleven weeks to do so but Frankie Valli moves into the #1 Spot this week with his monster solo hit "Can't Take My Eyes Off You". "Windy" by The Association creeps up a notch back into the #2 position while "Little Bit O'Soul" by The Music Explosion falls from #1 to #3. Meanwhile, "San Francisco" by Scott McKenzie holds at the #4 position for the third straight week. The Doors are up four places (from #9 to #5) with their first big chart hit, "Light My Fire". Two records making The Top Ten for the first time this week are "I Was Made To Love Her" by Stevie Wonder (up from #11 to #8) and "A Whiter Shade Of Pale" by Procol Harum, which climbs from #13 to #10. 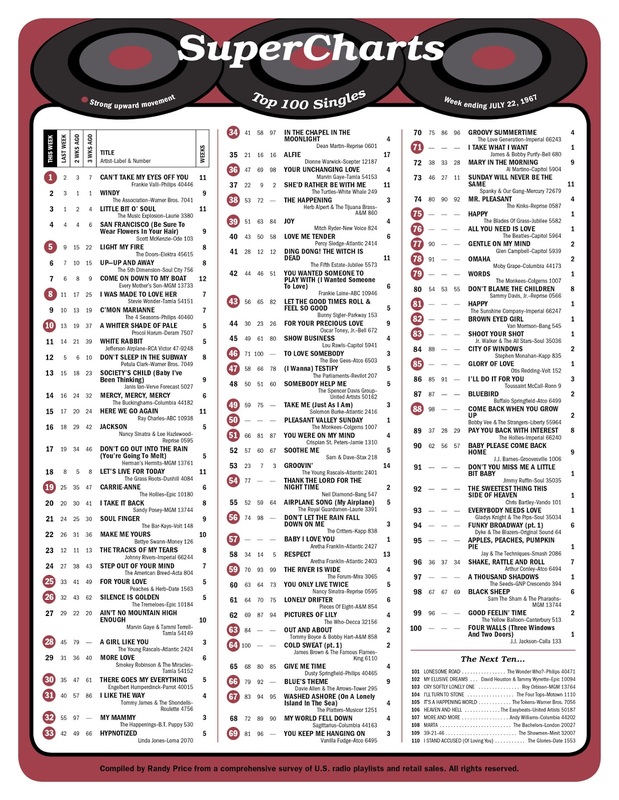 "Up Up And Away" by The Fifth Dimension and "Come On Down To My Boat" by Every Mother's Son flip-flop positions at #6 and #7 respectively and "C'mon Marianne" rounds out The Top Ten at #9, up a spot from the week before, giving Frankie Valli TWO Top Ten vocals this week. Other Top 40 climbers include "White Rabbit" by Jefferson Airplane (#14 to #11), "Society's Child" by Janis Ian (#15 to #13), "Mercy Mercy Mercy" by The Buckinghams (#16 to #14), "Here We Go Again" by Ray Charles (#17 to #15), "Jackson" by Nancy Sinatra and Lee Hazlewood (#18 to #16) and "Don't Go Out Into The Rain" by Herman's Hermits (#19 to #17). "Carrie Anne" by The Hollies climbs six places from #25 to #19. Other big movers include "For Your Love" by Peaches and Herb (#33 to #25), "Silence Is Golden" by The Tremeloes (#32 to #26), "A Girl Like You" by The Young Rascals (up 17 places from #45 to #28), "I Like The Way" by Tommy James and the Shondells (#40 to #31), "My Mammy" by The Happenings (#55 to #32, a jump of 23 spots), "Your Unchanging Love" by Marvin Gaye (#47 to #36), "The Happening" by Herb Alpert and the Tijuana Brass (#53 to #38) and "Joy" by Mitch Ryder, which climbs from #51 to #39. The #1 Album in America … again … is "Sgt. Pepper's Lonely Hearts Club Band" by The Beatles. This marks the album's fourth straight week on top of the charts. Sitting at #2 is "Headquarters" by The Monkees. After a week of its own in the top spot, "Headquarters" will occupy the #2 position for the entire fifteen weeks that "Sgt. Pepper" is #1. "All You Need Is Love" is released as a single here in The States (ten days after its British release). It premiers at #76 but soon will top our domestic chart as well. Jimi Hendrix leaves The Monkees tour. Several stories have circulated over the years as to how this all came to be … but the plain and simple truth is Hendrix didn't belong on the same stage as a group performing to a bunch of pre-teen and young teen-aged girls. Mothers were outraged by his very sexual performance … and most of the crowd only wanted to see The Pre-Fab Four, who screamed throughout Jimi's set "We want Davy!!! We want Davy!!!" A story was circulated that The Daughters Of The American Revolution demanded he be replaced but there is no evidence of truth to that … it is believed, however, that Hendrix capitalized on the rumor and used it as an excuse to step down. A few weeks later, in an interview with The New Music Express, Hendrix said: "First, they gave us the death spot on the show … right before The Monkees were due on. The audience just screamed and yelled for The Monkees. Finally, they agreed to let us go on first and things were much better. We got screams and good reaction, and some kids even rushed the stage. But we were not getting any billing … all the posters for the show just screamed out MONKEES! Then, some parents who brought their young kids complained that our act was vulgar. We decided it was just not the right audience. I think they're replacing me with Mickey Mouse." Jazz great John Coltrane dies of liver cancer at the age of 40.